Gor Mahia coach Hassan Oktay during the Caf Confederation Cup Group D match against Angolan side Petro Atletico de Luanda on March 17, 2019 at Moi International Sports Centre, Kasarani in Nairobi. 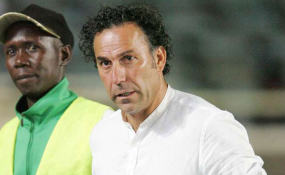 Gor Mahia coach Hassan Oktay is learning the hard way that not everyone who mobs him in celebration after matches is indeed a friend. The Turkish-Cypriot coach, who has been enjoying a good spell since joining the Kenyan champions last December, has revealed that he lost his mobile phone when he was lifted high by jubilant fans after the team's 1-0 win over Angola's Petro Atletico in a crucial Caf Confederation Cup match at Kasarani on Sunday. "They showed their love to me after the game, lifting me very high but when I was left to stand on my two feet, I did not have the phone. I have lost valuable contacts but that is part of life in this part of the world," Oktay told goal.com. After the hard-fought victory, which earned the team a ticket to the quarter finals of the tournament, hundreds of K'Ogalo fans stormed the pitch at the final whistle to celebrate. Oktay is not the first coach to lose his valuables under such circumstances. In 1997, German coach the late Reinhard Fabisch was subjected to a similar treatment after he engineered Harambee Stars' 1-1 draw against Nigeria in a crucial continental fixture at the same venue.